This easy to make meatball sub is delicious, meaty and melty with only half the bread! Great for a weeknight, or weekend family meal. Make the Mini Meatballs: In a large bowl, using hands, mix together all ingredients until combined well. using 1 tablespoon mixture for each, roll into balls. Mini meatballs can be made ahead. Transfer to a baking sheet and freeze until solid, about 1 hour. Divide between two heavy-duty resealable plastic bags, seal and freeze up to 3 weeks. Let stand at room temperature 10 minutes before cooking. 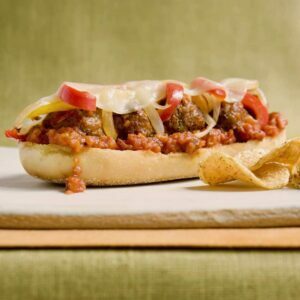 Make the Meatball Subs: Heat 1 tablespoon oil in a large nonstick skillet over medium-high heat. Add meatballs and turn to coat. Reduce heat to medium and cook, turning occasionally, until browned and cooked through, about 15 minutes. Transfer meatballs to a large saucepan and cover. Wipe skillet clean; add remaining 2 tablespoons oil with the onion and cook over medium-high heat, stirring occasionally, until just softened, about 4 minutes. Add bell pepper; cook, stirring, until softened and just starting to brown, 6 to 8 minutes. Heat broiler and place rack 6 inches from heat. Place rolls, cut side up on a baking sheet. In saucepan with meatballs, add sauce and heat over medium heat until warm, about 2 minutes; spoon onto each roll. Cover with onion-bell pepper mixture and top each with 2 cheese halves. Broil until cheese is melted, 1 to 2 minutes. Makes 55 to 60 meatballs. Can make ahead and freeze. Keep them on hand for other meals!